Stuck in a loop? Turn your musical ideas into amazing full songs today with our creativity-boosting guide! We'll reveal proven techniques, and reveal what makes music tick for your listeners. There's even a complete, start-to-finish arrangement workshop where we build a track before your very eyes! Get a little sampler of this game-changing tutorial with the video below, and get the rest only with issue 229 of Computer Music. Add flavour and punch to your sounds with this month's free plugin giveaway! A transient shaper with serious attitude, Audiority's TS-1 CM offers independent control over your sounds' Attack and Sustain levels, and includes delicious built-in saturation to further sculpt sounds. 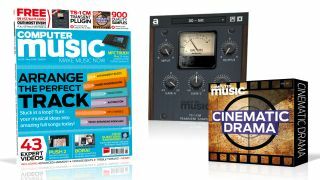 See more of TS-1 CM in the video below, and get this VST/AU plugin with issue 229 of Computer Music. For more info, head to our TS-1 CM page now! This huge pack of samples will bring the sounds of the silver screen to your DAW. Add drama with 121 impacts and stings; set a cinematic mood with 95 soundbeds and FX; get tense with 27 discordant sound; and grab loads more looped and one-shot samples in this massive collection. Get them only with this issue of CM! If you're looking to give your tracks that classic flavour, you can't do much better than adding a grungy, vintage break into the mix. In this article, we'll show you how to create your own, giving you the programming skills to replicate the vibes and techniques behind five classic drum-beat styles, and the production chops to age them to dusty perfection! Get acquainted with the new version of Ableton's incredible controller with this comprehensive guide! We'll take you on a guided tour of Push 2's Browser, show you how to slice and dice in the new, integrated Simpler, demonstrate ways to expand your production horizons, and loads more. Whether you're a Push 2 user looking to get more out of it, or fancy dipping your toes into the water - let us show you how to use it like a pro! For this video tutorial, we've blagged our way into the bass badman's old-school studio to interrogate him on his new-school production techniques. You'll see how Borai (aka Boris English) created his retro throwback tune Anybody from London using Apple Logic, a choice set of plugins and some timepiece outboard mixing gear. From Akai-style timestretching, through beat-slicing and processing, to effects and mixing, check out how his sonic artwork comes together!